This week I certainly was not disappointed when I saw this amazing beautiful clock from Kassandra Shabby. I love not only this clock she has made but she is a lawyer by trade! Love it! 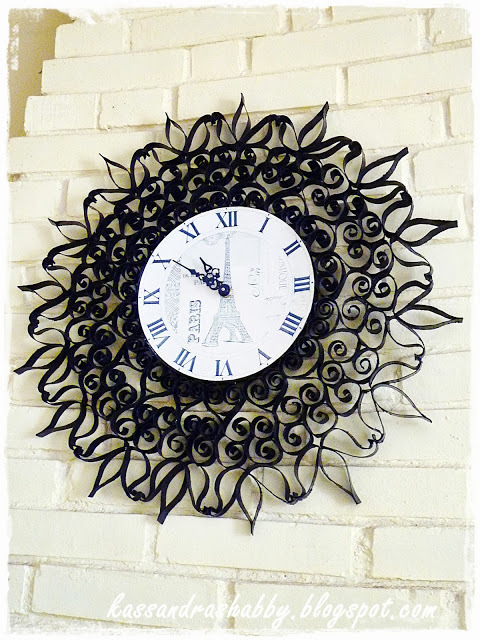 Now before you start wondering just why this wrought iron clock is my WoW Wednesday feature this week. Let me first tell you it is NOT wrought iron! This clock was made from….well jump on over and see here, you won’t believe it! So that is truly a WoW is it not?!! I am so inspired! Kassandra what a great project and congrats on being my WoW Wednesday feature today! Here is your pin! Want to see some other great WoW Wednesday features jump on over to here! Do you have a project you would like me to see or even a party I am not attending! Please let me know! Today I am linking up with those on Twitter. If you are on twitter please follow me and I will for sure follow you back! Next Post Google May Think Your Blog Comment is Spam?! Wow, that is really beautiful! Doesn’t even look like paper rolls at all!! I know right! I was shocked when I saw what it was! Thanks for stopping by! OMG Sandra, I feel so honored to have been featured! I deeply thank you for choosing my project and for your sweet comments; hope other creative ladies may try this technique because it´s easy, inexpensive, and the results are amazing! I´ve just discovered your blog, but will be following since now by Linky… Thanks again and have a nice day! I truly cannot stop telling people about your project! It really is something awesome! Thanks for stopping by to visit and it was an honor to feature you!